Threats of a student protest this weekend have forced Liberal Democrats to abandon a planned conference. The party's London MPs were to have met at a north London school on Saturday, but the head teacher has now cancelled the booking. Head teacher of Haverstock School, John Dowd, said the risks from the protest were too great. A replacement venue also pulled out - forcing the Lib Dems to postpone the meeting until some time next year. Mr Dowd said it was clear from protest websites that there was going to be a demonstration against the Liberal Democrat MPs meeting at the school and he thought that it posed too great a risk. After the cancellation of the meeting at Haverstock School the Liberal Democrats had planned a substitute venue - but details of this were also circulated by protesters, leading to the event being called off. Fiona Edwards, speaking for the Free Education Campaign protest, said: "The cancellation of the venue for the conference is yet another sign of the deep unpopularity of the Liberal Democrats' policy on fees and is hugely embarrassing for the party." The vote by MPs on whether to raise university fees in England to an upper limit of £9,000 will be held next week and a number of protests have been announced. Liberal Democrats have become particular targets for student protests as their MPs had given students a signed pledge that they would vote against any increase in fees. There has been a wave of protests and occupations in universities, against the fee increase and plans to cut public funding for many arts and humanities courses. Students at the London School of Economics have now begun an occupation. This weekend students are planning talks which will link the current wave of unrest with the protests of the 1960s - in which students at the London School of Economics played an iconic role. There are also occupations taking place in universities including University College London, SOAS, Newcastle, King's College London, Leeds, Sheffield and Cambridge. 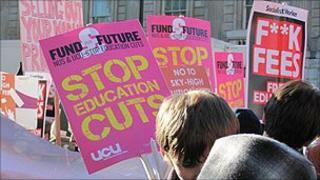 On Friday, the National Union of Students has sought to broaden the protest against fees by encouraging parents and families to write to MPs. "Over the past few weeks I have been contacted by a great number of parents who are desperately concerned about how their children will be affected," says NUS president, Aaron Porter.